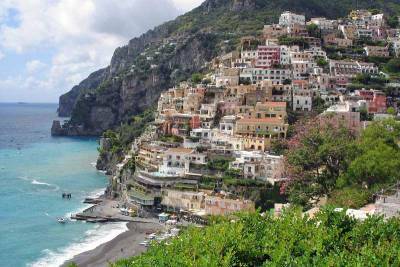 Visit Amalfi Coast by starting in Positano. 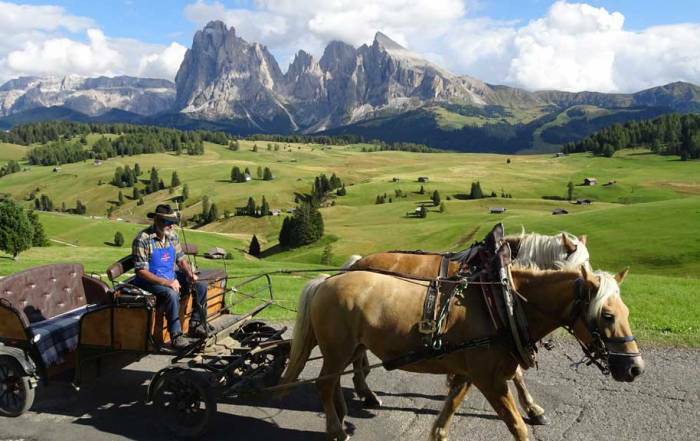 It’s about an hour from Sorrento. In Positano you will find designer boutiques and galleries. 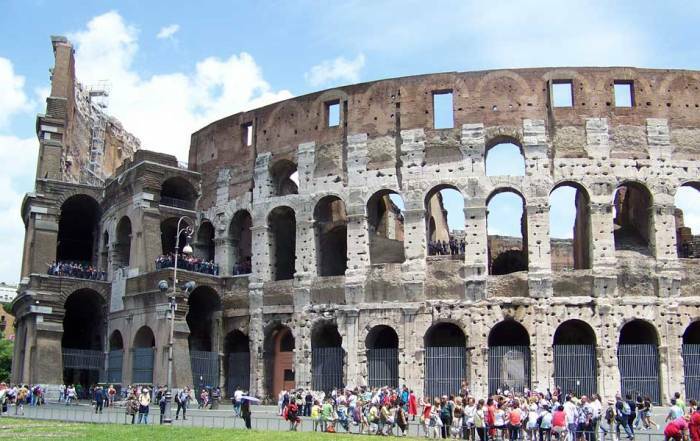 Strict building codes preserve its history. The small town of under 5,000 people is set in a ravine. Positano has only one street that allows vehicles. Be prepared for lots of stairs. Find a rosticceria for deli meats and antipasto. Try some delizie al limone (lemon creme pastry) or the torta positanese (almond cake). Then head down to the pebbly beach for a picnic. The church of Santa Maria Teresa of the Assumption, with its tiled dome, is right beside the beach. As an alternative to a picnic, try Ristorante Scirocco or the cafe called Capricci. Travel a mile to the rocky beach at Spiaggia di Laurito and eat at Da Adolfo. 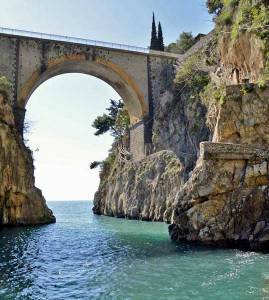 After leaving Positano toward the town of Amalfi, look for the crossing of the Furore Fjord and the Cave of Smeraldo at Conca dei Marini. 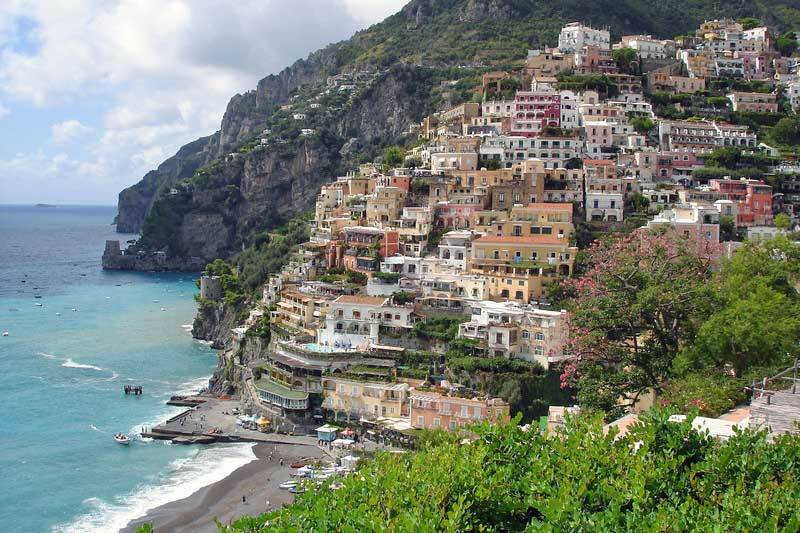 The town of Amalfi is about a half hour from Positano. It was a powerful city state long ago in the 1100s. 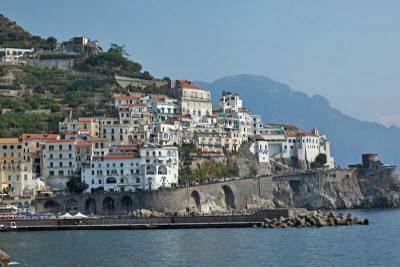 Today about 5,000 people live in the town of Amalfi. The Amalfi Cathedral with its Cloister of Paradise dwarfs the small town. 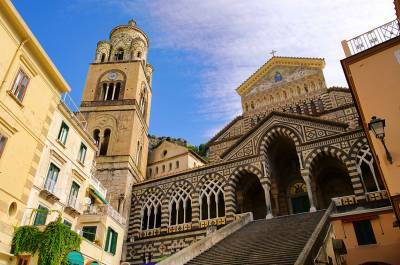 The Amalfi Cathedral is dedicated to the apostle St Andrew, whose remains were transferred here in the 1200s. The Paper Museum is also an interesting stop. Try a gelato from Bar Flavio Gioia at the harbor. 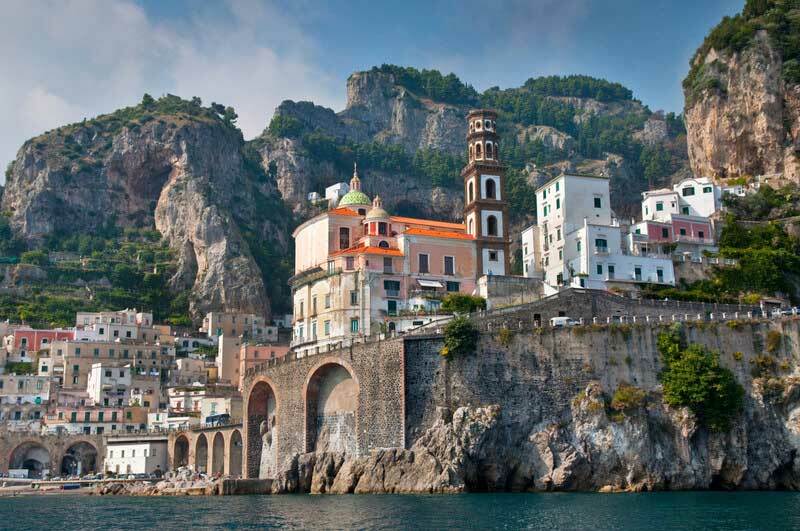 Head a couple miles east for picturesque cliffside views at Atrani. Salerno is the eastern end of the Amalfi Coast. Your east bound cliffside adventure ends when you reach Salerno. Visit Arechi Castle for its 8th century fortification. Catch views of Salerno and the Mediterranean Sea from Arechi Castle. Ravello is about 15 minutes from Amalfi. Unlike the other small towns when you visit the Amalfi Coast, Ravello is 1,000 feet above the sea. The village of Ravello is a series of gardens hovering over the coast line. 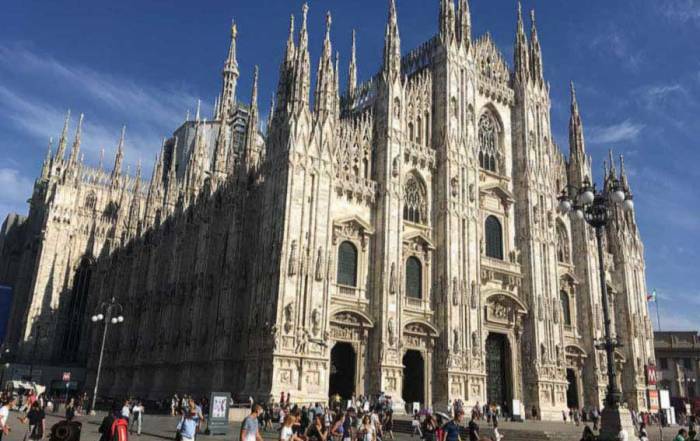 Visit San Pantaleone Church. Directly beside the church are the grounds of the Villa Rufolo and a classic view over the town and the Mediterranean Sea. 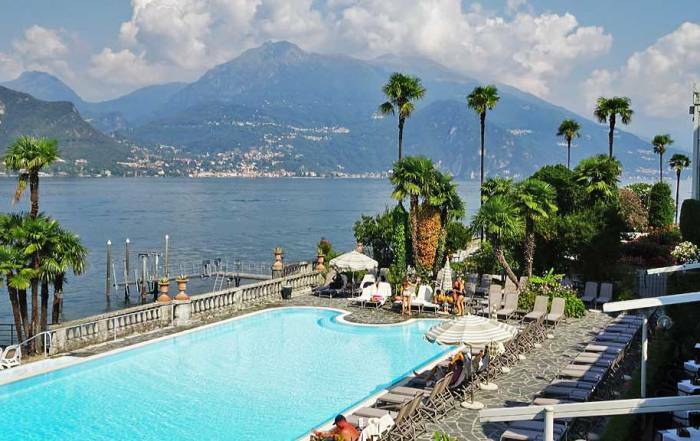 Next, enjoy the views at Villa Cimbrone. The outdoor Ravello Festival is held each August beside the Ravello Cathedral at the Villa Rufolo. The Ravello Concert plays the music of Wagner while the audience also enjoys a view of the orchestra against a back drop of the Amalfi Coast below. The best Amalfi Coast weather happens in July. The Amalfi Coast weather in summer is also the height of the tourist season. Expect highs of 27 C (80 F) and lows of 15 C (60 F). 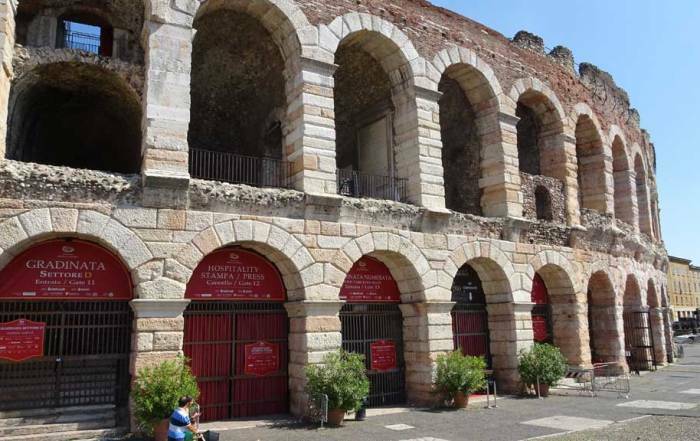 Temperatures are even higher in August and the tourist trade continues at its peak. The rainy season reaches its wettest levels in November when rainfall can average 8 times that of the summer. Tourism drops off in the rainy weather. Average highs in November are about 18 C (65 F) and lows of 8 C (45 F). You can get to the Amalfi Coast easily by train or bus from Naples. You can also get to the Amalfi Coast by ferry from the island of Capri. There are no major airports for you when you visit the Amalfi Coast. 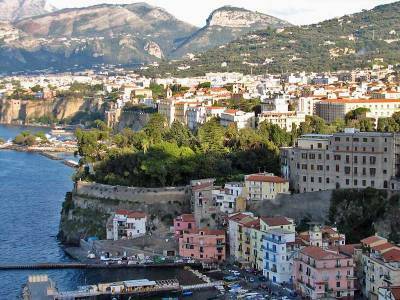 Sorrento is a common home base for touring the Amalfi Coast. From Sorrento you can take an exciting bus ride along the steep twists and turns of the coast line. The buildings and the roads cling to the cliff sides. It may be worthwhile to either rent a car or hire a private driver, so that you can enjoy the Amalfi Coast at your own pace. You can also arrange boat excursions along the coast and its small harbors. For those in a hurry, you can travel one way from Sorrento to Amalfi in just over an hour. 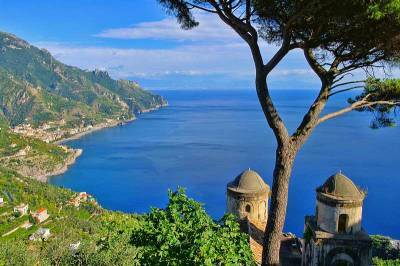 Allow 2 hours travel time from Sorrento to Solerno, but without stopping, you will miss the essence of the Amalfi Coast. The Amalfi Coast isn’t a common stop for first-time tourists visiting Italy, but it’s an extremely popular spot for veteran travelers and the wealthy. 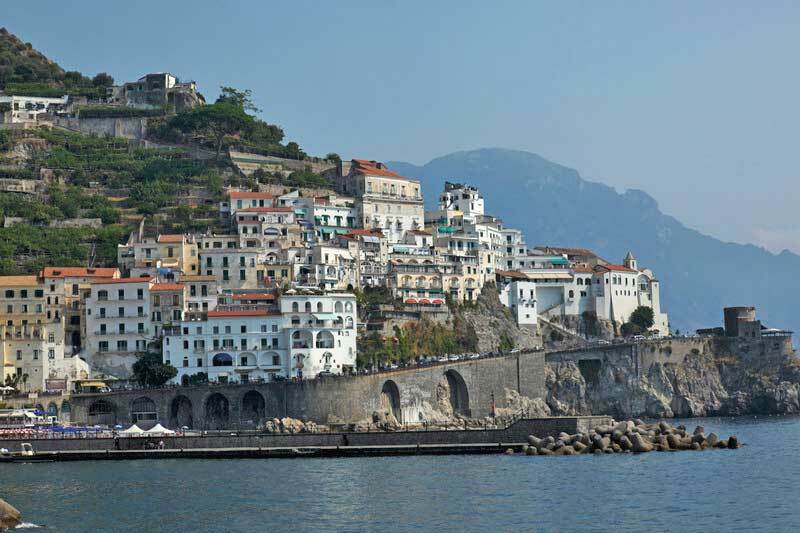 The route clings to the Tyrrhenian Sea of the Mediterranean from Sorrento to Salerno, but the most popular spots are the small cliffside towns of Positano, Amalfi and Ravello. The Amalfi Coast is not an area of tourist attractions. Plan to make shopping, eating and sunny beaches your main activities.